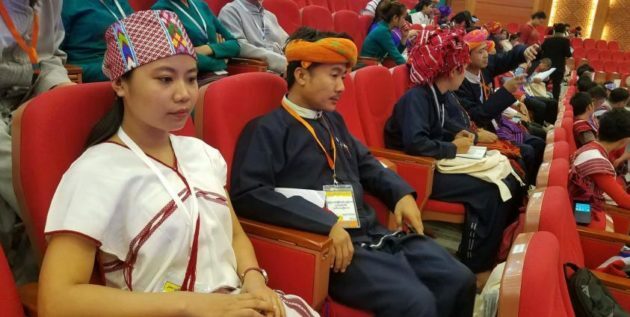 National solidarity should be built in the union through freedom, equality, and justice between the ethnic people and not through military pressure and force, said the Karen National Union (KNU) chair General Mutu Say Poe in his speech on the first day of the Union Peace Conference – 21st Century Panglong held at MCC-2 Hall in Naypyidaw on July 11. “National solidarity cannot be built through force and military pressure. National solidarity must be built through the elements of independence, equality, and justice. It must be built through trust, understanding, and goodwill,” General Mutu Say Poe said on behalf of the Nationwide Ceasefire Agreement (NCA) signatories. He said the peace process is like climbing a greasy pole and urged everyone to prevent it from declining from the current stage. The President, the State Counsellor, leaders of ethnic armed organizations, the Tatmadaw Commander-in-Chief, international organizations, and ethnic representatives attended the opening ceremony of the third session of the 21st Century Panglong, which kicked off at 10 am on July 11. The State Counsellor Daw Aung San Suu Kyi, the Tatmadaw Commander-in-Chief Senior General Min Aung Hlaing, and the Arakan National Party’s vice-chair Daw Aye Nu Sein, on behalf of the political parties group, respectively delivered their speeches. “Ethnic groups shouldn’t be regarded as narrow-minded and extremists. We want to hope for magnanimity from powerful groups especially big Burmese parties and strongly-built Tatmadaw. Narrow-mindedness tends to disappear under magnanimity,” Daw Aye Nu Sein, vice-chair of the Arakan National Party, said as she urged for magnanimity towards ethnic people. The National League for Democracy (NLD) government held the first session of the Union Peace Conference (21st Century Panglong) from August 31 to September 2 in 2016 and the second session of the conference from May 24 to 28 in 2017. The third session of the conference held from July 11 to 16. The State Counsellor said the government plans to hold another session within this year, two sessions in 2019 and three sessions by 2020.